Can true love last, now that it has been unlocked? Lovers from all over the world will have to find a new way of securing their affections for one another, as the famous ‘love-locks’ on Paris’ Pont Des Arts bridge were stripped from the railings earlier this week. Over the last few years, couples have flocked to the romantic spot to lock their own padlock to the railings of the famous bridge and eternally secure their love for one another – or so they thought. After concerns that the combined weight of the padlocks could cause the bridge to collapse, the city removed every single padlock, taking away thousands of tourists’ symbols of never-ending love. 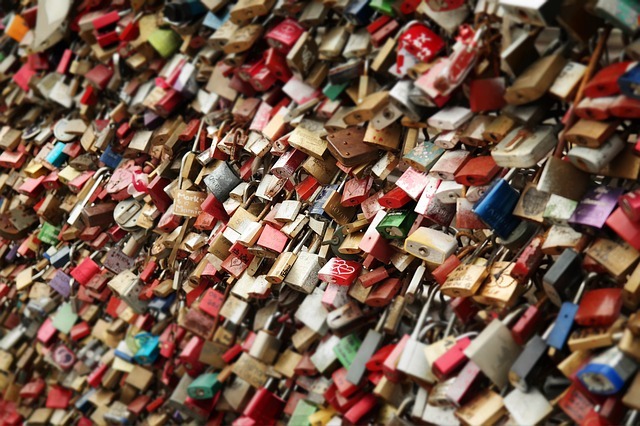 With the padlocks gone, couples will need to find another way to make their love last forever. While cards, chocolates and flowers are lovely sentiments, they do not last for eternity; the only gift that can truly be treasured forever is a piece of high-quality jewellery. For centuries, an eternity ring has been a universal symbol of devotion. Given as a gift to celebrate the beginning of a new life together, the birth of your child, or to commemorate a special anniversary. We have a stunning array of beautiful eternity rings at Hancocks, perfect to demonstrate just how much you care for your partner. Opt for a unique combination of shimmering gemstones, presented in luxurious silver and gold settings, to create a ring that it as special as your relationship. 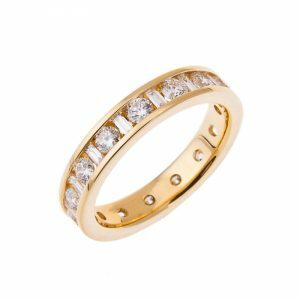 Diamonds are renowned for their unbreakable quality, which makes them the ideal symbol of devotion, just perfect for an eternity ring. This Bar Set Diamond ring has brilliant cut white diamonds that sparkle radiantly in the light. The platinum setting evokes an exquisite modern look and is a superb addition to everyday wear. On the other hand, the contrast of a classic gold band also gives a sophisticated charm to a diamond eternity ring, like this timeless yellow gold full diamond ring. Sapphire is a mystical jewel. Channelling their hypnotic beauty from the blue depths of the ocean, intense hues stand out from a halo of platinum and gold. An eternity ring dipped in sapphires has a truly regal quality, signifying deep everlasting love. This stunning platinum sapphire eternity ring takes a fresh twist on a classic style, as the three rich blue sapphires sparkle brightly among two brilliant cut diamonds. Distinguish yourself from the crowd with a unique yellow diamond eternity ring. The vibrant yellow stone ignites the wearer’s finger with blazing passion, symbolic of a love that can never be extinguished. A truly exceptional piece of jewellery, this 18ct yellow gold eternity ring is encircled in brilliant cut yellow diamonds to create an exquisite look. 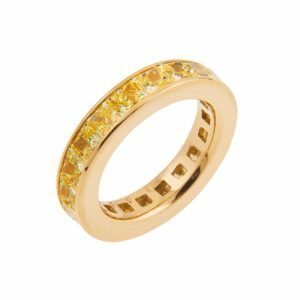 An equally radiant piece is this yellow diamond eternity ring, protected by a yellow gold claw setting. Both of these spectacular eternity rings are sure to showcase your love. 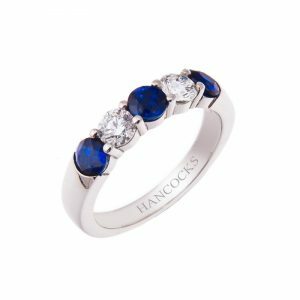 Just like the vows that you made to your partner on your wedding day, Hancocks has vowed to keep your piece of jewellery as perfect as the day you bought it. You can return to the Hancocks store in Manchester and one of our jewellery experts will take care of your item, providing it with a careful complimentary cleaning. Additionally, you can also have your Hancocks diamond ring upgraded to make it even more beautiful as your love continues to flourish.